Der Artikel Once Upon a Time Season 7 (final Season) (UK Import) wurde in den Warenkorb gelegt. Fantasy / TV-Serie, 909 Min. 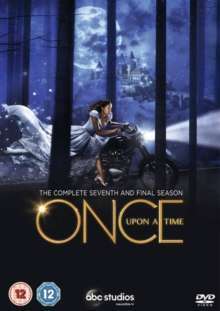 The seventh and final season of the US fantasy drama which takes inspiration from various fairy tale characters. Moving between our world and a parallel fantasy one, the series follows Emma Swan (Jennifer Morrison), a 28-year-old mother who is believed to have been prophesied to break the curse cast by Evil Queen Regina (Lana Parrilla) which erased everyone's memories in the town of Storybrooke, leaving them frozen in time. In this season, Lucy (Alison Fernandez) attempts to help Henry Mills (Andrew J.West) when a new curse brings a number of characters to Hyperion Heights in Seattle, Washington.